Happy New Year to you all. I'd like to take a wordy moment to thank you for all your kind words about my photos over the years. I look forward to seeing your photographs and see what's caught your eye and lens. who knows what a new year of WW will bring? Happy New Year to you! Nice horse-y shot. That looks like it belongs in a coffee table book! I love it! And a very happy new year full of love, joy and many more photos to you too! Looks like someone is getting ready to SADDLE UP! Happy WW, and Happy New Year! You have NO idea how much I look forward to your Wordless Wednesday photos! And this one is another winner! What a cool little saddle stack! I think this photo is great! I never know what photos you'll have. Happy WW and Happy New Year! That's a nice, cheerful display. Hope you are having a great Holiday week. You have such a good eye for a great photograph. I always look forward to Wednesday to see what you've found lately. I agree you have a great eye. I would look at that and just think it was a big mess! This is a wonderful photo...it brings back many memories of my childhood for me when I spent hours and hours around horses and in barns. 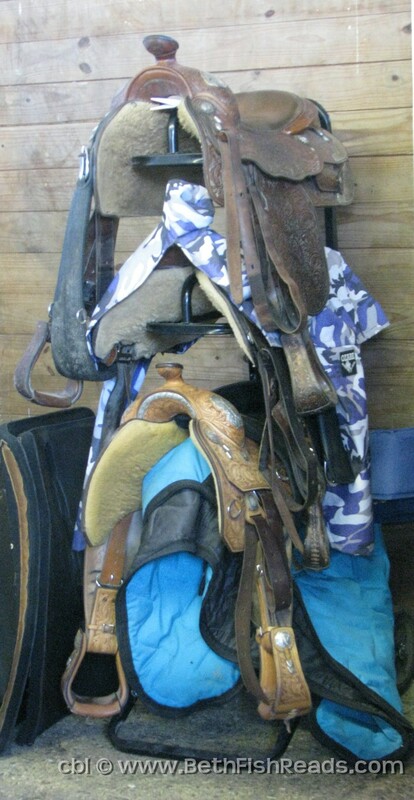 Fun splashes of blue among the saddles!